Seems like it's been a while since I featured an instrumental, and that probably has something to do with the fact that I'm listening to more soul than funk this summer. Anyway, I've been keeping my eyes open for funk sides as well (I can't quit completely no matter what other music engrosses me), and this one came off the 'bay for a nice price....and appears unplayed to boot. 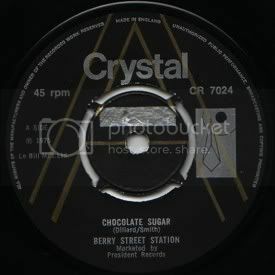 It's a UK pressing, but I believe the US label that 'Chocolate Sugar' got a release on was LeCam Records out of Texas. The group name on that release was Six Feet Under, but it seems to be the same recording. Have a listen to this tune over at funk45.com.